Posted: Tue Oct 24, 2006 9:05 am Post subject: Who is shown here? Some say it is Akhenaten and Nefertiti-it could be possible they are both portrayed as men as some kind of symbolisim to show they are equel kind of like hatchepsut. But both are shown as masculine as eachother-neither one is more feminine than the other...although is that part of a dress belonging to the person on the right? Near their legs and obscuring the offering table? And if you look at the person wearing the double crown again, notice at the end of the ribbons flowing from their crown it looks like a section of that goddess dress Nefertiti always wears...maybe Akhenaten and Nefertiti ruling as equals! Maybe a co-regency between the two not as Pharoh and Cheif Queen but as two Pharoh's?! Akhenaten always seems to have prefered the blue crown so it makes sense he would wear it. 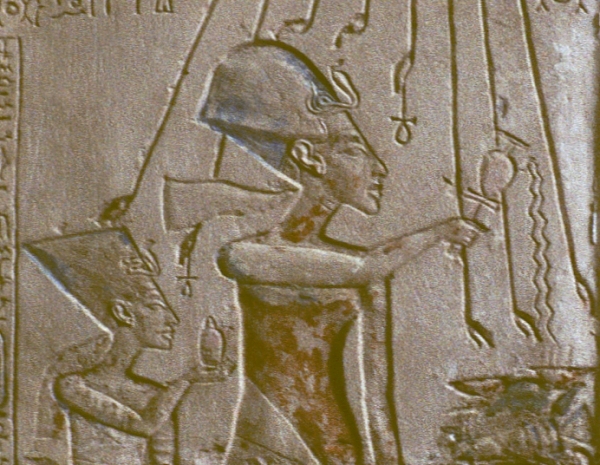 Proof Nefertiti was considered at this time as equal to Pharoh is in the famous smiting scene where she is aboard the royal barge, with her head in place of that of the gods on the end of the oars, usually only a Pharoh is shown smiting in this ritual way- but Nefertiti here is shown also as a living goddess. See how worn Nefertit's goddess dress can become? Here it looks like she is not wearing anything but you can just make out the ripples of the dress-is the stelae above simply a candidate of erosion? Akhenaten allowed Meritaten to be heiress and the kings house was converted for her. So the prospect of Akhenaten disregarding old customs of male only Pharoh's is highly possible,considering his emphasis on women throughout the whole amarna period. Could it be Akhenaten and Semenkhare, assuming Nefertiti died of plague. There is evidence the large columned hall built at amarna towards it's end was rushed for Semenkhare's corination. What do you think?I personally don't know what to make of it-so much from amarna confuses us, questions are never answered from amarna evidence -more questions always arise from amarna evidence than can be answered? All i know is it's an incredibly beautiful picture, the intamicy and fine releif craftmenship-interesting how the double crown still keeps the wire(the thing that looks like a moth/butterly tounge), usually they are omitted. This stelae has always intrigued me and is one of my favourate amarna pieces. So whats your opinion on it? Maybe i am wrong about them being ecclesiastical-because u can see the one on the left has a round edge to it like a aquare throne-maybe they are square thrones with a slight curve within the seat? 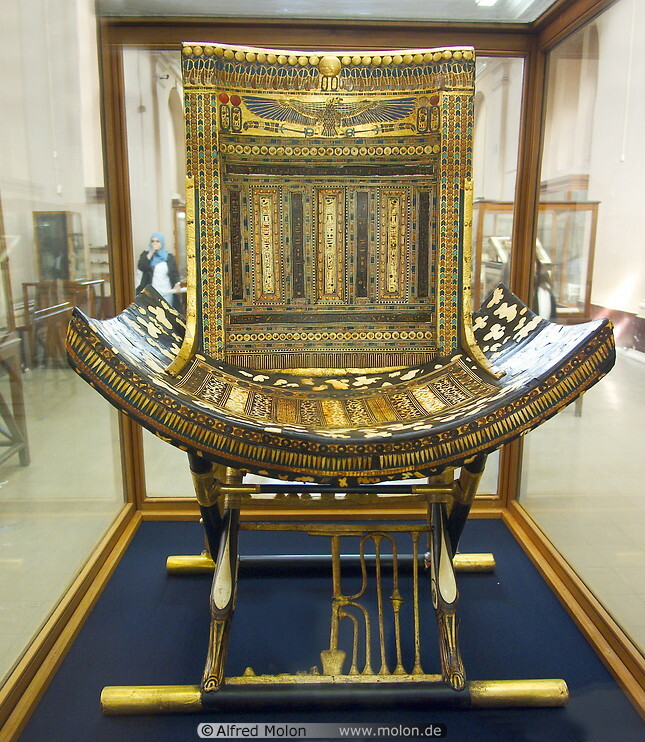 Actually the chairs remind me of this one-used by Tut as a child at Amarna! 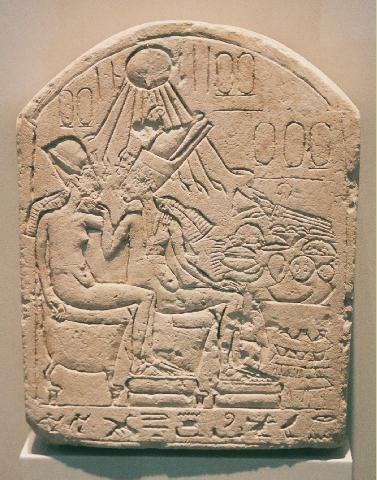 This stela looks to me as a votive one for a dead ruler and his queen. SemenkhkarÃª and Merytaten would be good candidates. What was Pase intention when he made or ordered it is everybody guess! LOL That's a hotly debated stela. The people who think it's Nefertiti would point to the fact that the person on the left seems to have breasts. Another thing pointed out is the cartouches. The two double cartouches to the left and right of the Aten must have contained the names of the Aten. That leaves the three cartouches on the right. This would fit with a double cartouche for Akhenaten and a single one for Nefertiti. If they were two kings we would expect 2 double cartouches? First of all, this stela is nothing official. At Amarna a character with breast can be a man. Now it's all depend how one dreams Akhenaten's succession. IMO we have SemenkhkarÃª and then Neferneferouaton (=Merytaten). Back to the stella, may be Pase ordered it with only one cartouche for the prenomen as both share the same one. Neferneferuaten with the red & white crowns make sense as she restored the old order. It's also been suggested that each of the figures on the stela has three cartouches (if you look at the left hand pair, a third misshapen one appears to have been squeezed in just above) - ie two kings, not a king and queen. LOL Especially since during this period men and women wear both male/female clothes! Very confusing- i doubt we will ever find the answer...although part of the great palace is still under farmland-maybe some sort of clue is yet to be found? Although the niles waters have probably destroyed this area completely.